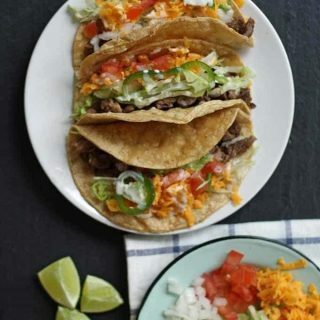 An easy recipe for grilled arrachera steak tacos – marinate it for an hour, grill and pile on the garnishes! 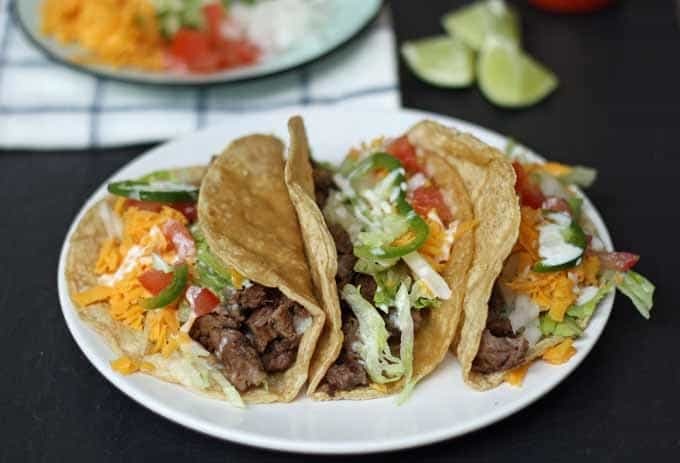 Somewhere back in the day, I shared with you my recipe for taco seasoning – this is important because it is a key ingredient in today’s recipe for grilled arrachera steak tacos. You’re probably sick of hearing about Mr. B. and me’s love of grilling. But have I talked about our love of hot sauce or tacos yet? Today is the day! We each have our go-to favorite hot sauces. We equally love us some Sriracha and Mr. B loves Tabasco – I am a huge fan of Cholula. It’s funny. I buy new hot sauces all of the time. If I see an interesting one at the store I run through my little mental hot sauce inventory – do we have it yet? No? Consider yourself purchased! And we still keep eating with our favorites. Mr. B. is slowly getting more experimental – maybe because he can’t find his Tabasco bottles amidst the other 20 hot sauce bottles. And I see a hot-sauce change in his future. Me, I have been hooked on Cholula for a little while but I’m a hipster for hot sauce. I was a huge fan of the Sriracha until I realized everyone else was too. Cholula then became my favorite. It’s only a matter of time before the rest of the world realizes they have been confused – Cholula is by far the best. And then I will sadly move on to another hot sauce. 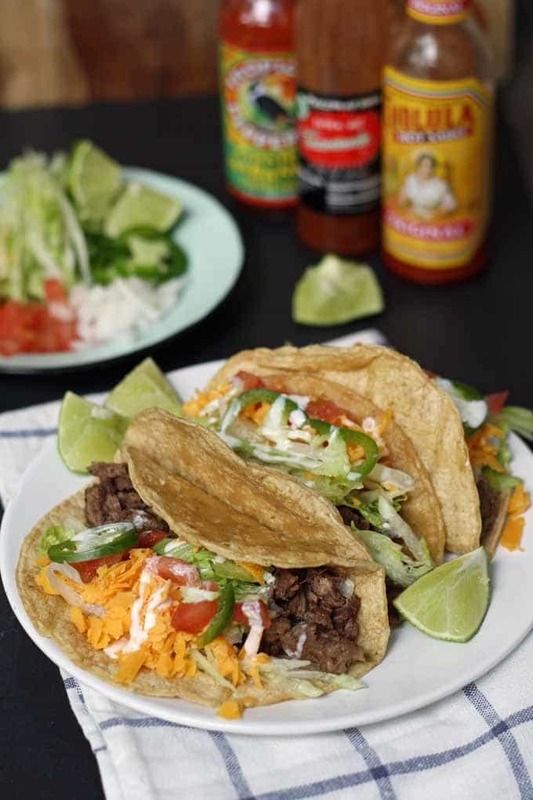 Whether I’m slathering my tacos with Cholula or another sauce, I can guarantee you that this particular taco recipe is the one I will use. It is one of those labor of love recipes – tried over a number of years and perfected (kind of like my chili recipe). What Kind of Meat is Arrachera? Go to your local butcher or the butcher counter at your local market. Ask them for a few pounds of arrachera (also known as skirt steak) and ask them to tenderize it for you. This will let you marinate the steak for a shorter amount of time. If they can’t or won’t tenderize it for you, you can do it at home as well. Mix up your marinade and let the steak sit in it for an hour. I usually just throw it all in a Ziploc bag and then throw the bag into the refrigerator. Grill the arachera to your desired temperature – when you take it off the grill let it sit for at least 5 minutes before you chop it up into taco-size pieces. 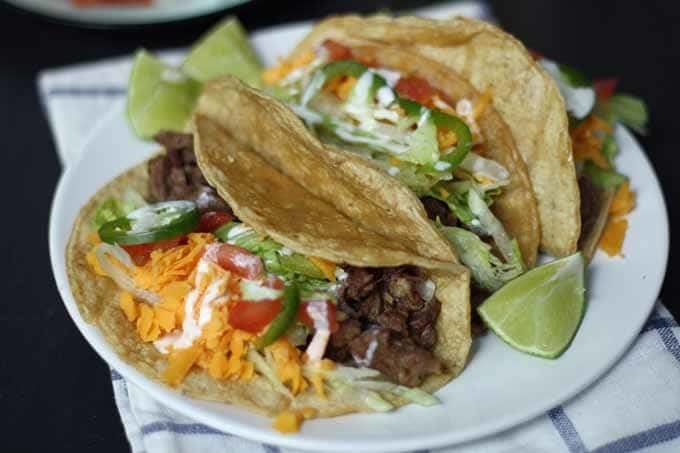 In a small bowl, combine the extra virgin olive oil, vinegar, and taco seasoning. In a plastic bag (or small bowl) place the steak. Toss the steak with the marinade, making sure that the meat is completely covered. Refrigerate for 1 hour in the sealed bag. If using a bowl, cover with plastic wrap. Grill to desired temperature. Remove from grill and slice steak into bite-size pieces. Toast tortillas on the grill, then fill with meat and garnish as desired. 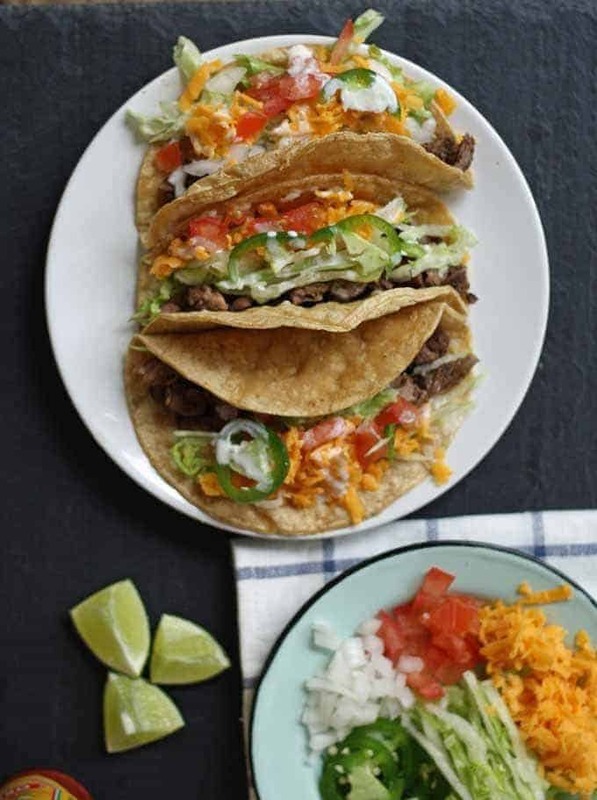 Looking for more recipes perfect for a fiesta? Try my 8 layer taco dip recipe or this delicious recipe for slow cooker taco dip. Thank you for sharing this recipe! My husband loves tacos. I’m going to look for Crystal hot sauce next time I go to the store! And I had the same problem with “EVOO” the first time I saw it – I considered typing it all out, but it takes so much room. LOL, sorry for the confusion! WOW! These look so good! Thank you for sharing the recipe. These look and sound amazing! We love tacos! Pinning this to save and share.